The second day schedule was hectic and filled with places to shop. Delhi is a big city with unpredictable traffic, so going from one place to another can take a lot of time. We had only two days to tick our long list of good to buy at Delhi, so we started our day early. We had quick breakfast at the guest house and headed towards Lajpat Nagar, our shopping destination for the day. We decided to take metro to go to Lajpat Nagar central market, it took us around one hour to get there. After we got down from metro, again we took rickshaw to go to the central market. But unlike Karol Bagh, Lajpat Nagar is huge. There were all kinds of small colorful shops in the central market displaying dupattas, shoes, bangles, kurtis, sarees and many more. We needed to buy a lot of sarees so were looking for one place to buy most of it. As we wandered from one alley no another, we couldn’t find a decent saree shop. It was hot and sunny that day and I started to get frustrated as I hadn’t even made a single purchase! We asked several local people there about good saree shops but we didn’t get a satisfactory answer. So, we changed direction and headed towards a big road instead of wandering in the alleys. There I saw a familiar name, it was one of the names I found on the internet, so we quickly went inside to see their collection. As we sat down to see what they had to show, we were not impressed by their collection at all. At this point, we were hungry and irritated. So, A and I both decided to take a break and go for lunch. It was past mid-day already and we had only bought one saree for A’s grandmom. But nevertheless, we needed a break from the hot Delhi day. A had looked up a place to have lunch near Lajpat Nagar area over the internet. We wanted to have good lunch and rest for a while before we start looking for saree shops again. So, we went took an auto and went to nearby Defence Colony. 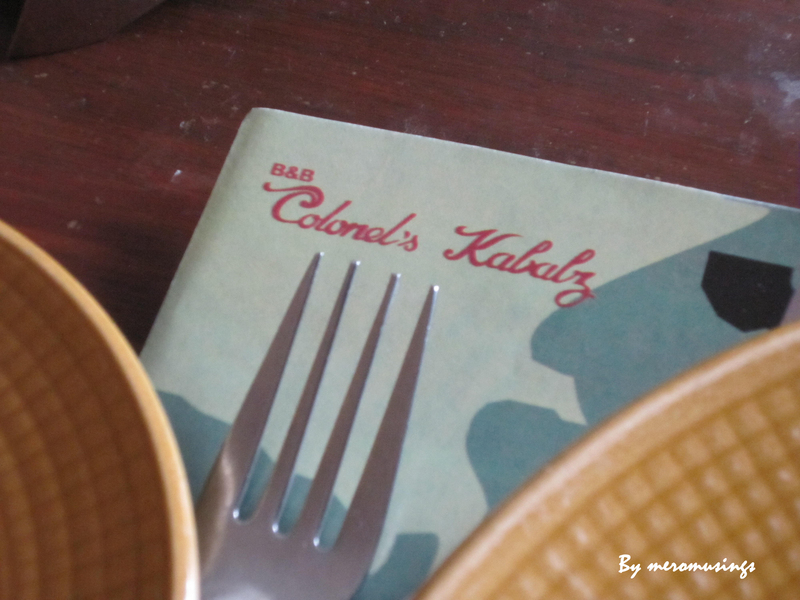 At Defence Colony there were a lot of places to eat, but we wanted to go to the famous Colonel’s Kabab. The auto driver took us right at the door of Colonel’s Kabab. We were happy to have found the place with less effort :). As soon as we reached inside, we made our order. We ordered romali roti, my most favorite roti :), mutton kabab, mutton kakab roll, dal makhni, chicken dum biryani and jaljeera drink. The place was quite old and famous. There were pictures on the wall depicting its rich history and the decor was naturally antique. As the food arrived, Jaljeera was very good, the mutton kebab was not as good as expected, romali roti was soft but the best order was chicken dum biryani. All in all, we were satisfied with our lunch and we rested there for a while before we went out to find shops. After lunch, we headed back to the central market and went to the same wide road to look for more saree shops. This time we found a decent shop and as we started looking for sarees, we noticed that they had fixed process of discount and hence we didn’t need to bargain a lot. At this place we bought most of our sarees and I’m quite satisfied with the purchases we made. It was already 7pm by the time we finished shopping. After this we went to the central market once again and A had the famous pani puri there. 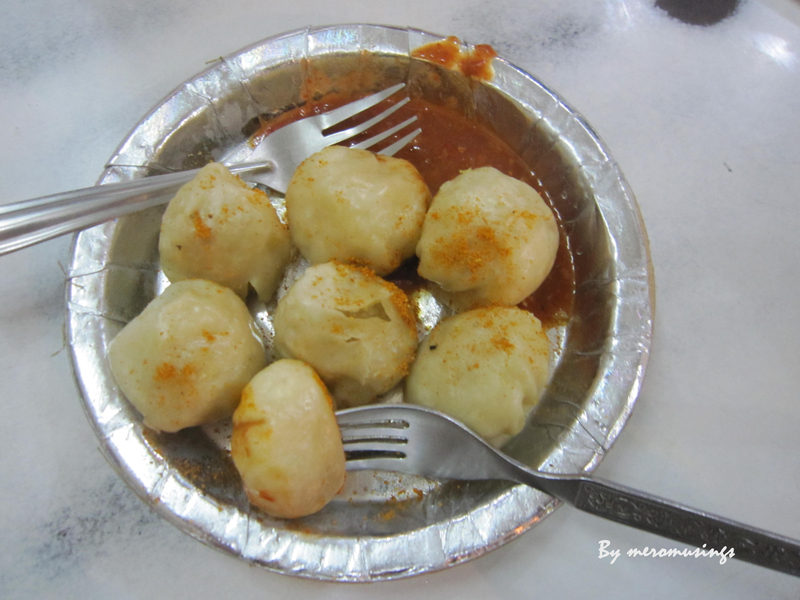 As I had throat infection, A didn’t let me eat those delicious pani purees :(, but he said they were the best he ever had, but I had the chance to eat the best chicken momo at Lajpat Nagar Central market, but it was not as good as the Nepali momo :). After that, we went to South Extension market. There again we bought few sarees and it was time for dinner. For dinner, we went to a Bengali vegetarian place, there we had masala dosa and it was yummm!!! We also had some bengoli sweets. On the final day, we had very less time and a lot of things were still to be bought. At first we went to Karol Bagh to pick our sarees, we snacked on Dosa and Chole Bhature at the local South Indian joint, A said it was the best dosa he ever had. Then we went to South Ex. Mom had asked me to buy special silk saree for her, so we went to Nalli’s to buy silk saree for mom. It has the most serene color of warm pink with some beads work. Then we went to few other saree shops in South Ex. South Ex is more expensive but offers very good quality of authentic sarees, so we bought my wedding saree and reception saree at South Ex. The sarees in South Ex were simply gorgeous, they had the most amazing sarees but I had to stick to my budget and my agenda, so I asked the shopkeeper to show me the specific kind of sarees in my range. Delhi saree shops are very good at salesmanship, they make you feel like a princess asking you to try their most special pieces. I’ve bought few sarees only because it looked adorable when I tried them on. After the hectic day of shopping, we had local pau bhaji, papri chaat and a glass of Mausambi(sweet lime) juice. Then we went back to Nirman Bihar. As we got down at the metro station, A wanted to try the chicken tandoori one more time before we left; so he bought some chicken and we ate it at the guest house. But wait, our Delhi experience doesn’t end here. One thing we were discussing on our way to the airport was that we didn’t get much time to explore Delhi food culture. 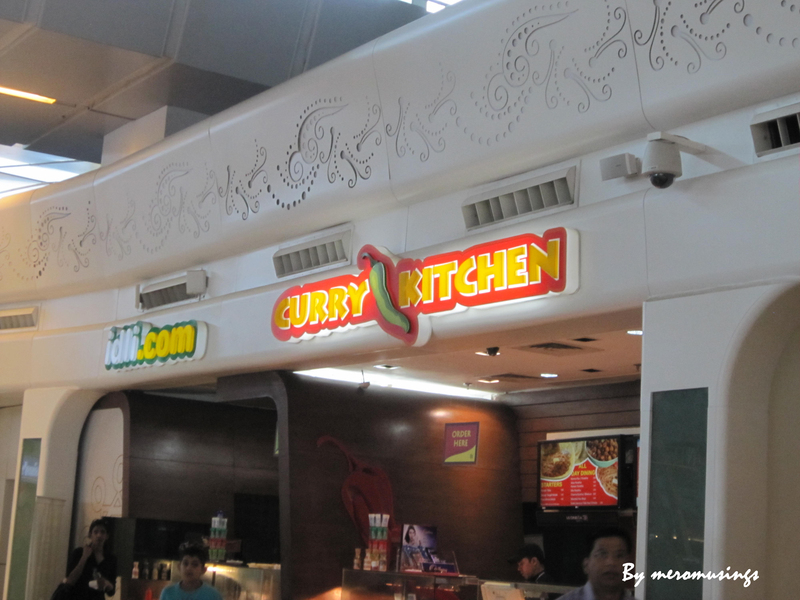 So, when we reached airport, we wanted to try the Indian food counter at the airport as well.We went to Curry Kitchen at the airport food court. 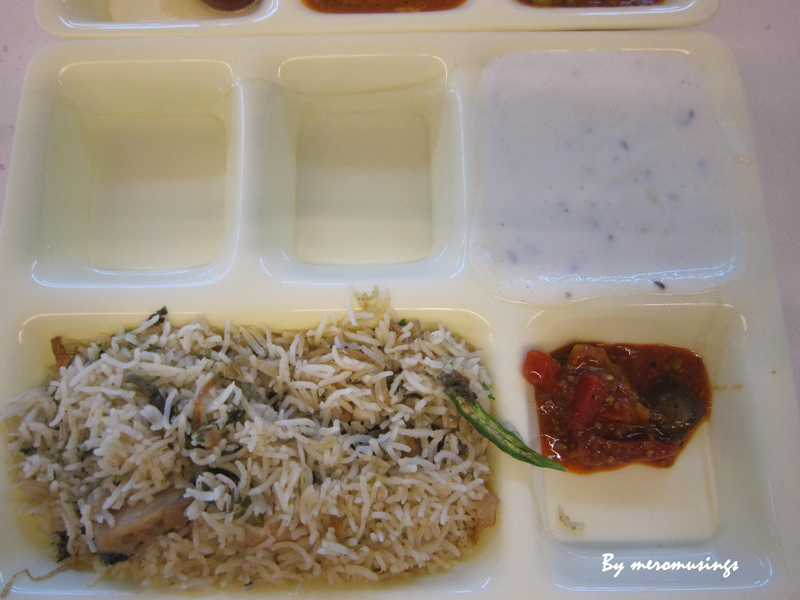 We ordered one North Indian thali and one Hydrabadi Biryani, the north indian thali was really good but the Hydrabadi biryani was a disappointment, you can judge them from the pictures. We enjoyed the local delhi food a lot. I bought some sarees with sheer satisfaction, some because I needed to and some out of total urgency. It was a crazy shopping experience and pure indulgence :). I was happy and satisfied to have been able to spend like that on my own, it even made my parents proud. All in all Delhi was a good experience and if I get a chance, I’d like to go there again and visit neighboring cities like Agra and Jaipur. Let me get started with my Delhi experience straight away. The first thing you notice about Delhi besides its new airport is the Delhi traffic. Delhi is a big city and there have been huge developments in the infrastructure of Delhi. The roads, toll ways and highways are as good or even better than Bangkok roads. You will soon notice wide roads as you start making your way towards the city from the airport. This is not my first visit to Delhi, however this will be my first chance to experience it. We took a prepaid taxi from the airport to get to our guest house. In Delhi, you have to know how to deal with the locals, if you’re not careful, there are chances of being deceived. For example, google the location you’re going to in advance and remember the nearest landmark, metro station so that you can tell the driver where to go or else, there are chances they might ask you to pay extra saying the location you paid for is quite far from the exact location. But Delhi city is not only about being careful all the time; once you know how to deal with the locals and outwit them in some situations, they can even befriend you and give you some suggestions. After we reached our guesthouse, A was eager to try some Indian food and I was eager to go to the market for shopping. We both had clear agendas of visiting Delhi, my agenda was saree shopping and A’s was Indian food :). But I kept reminding him that my agenda was more important than his :P, but ofcourse we’d find time for food :). So we headed out to the nearest mall. We had planned our trip and places to shop in advance as we had only two days to buy sarees. In that mall, we went to a shop named Meena Bazaar. Meena Bazaar sells amazing sarees, they have the most unique collections, but the price range is a little higher, a good saree starts typically from 6000 Indian rupees and go higher upto 30,000 IRs. If you want to see what kind of sarees are available there, you can visit http://meenabazaar.in/. We noticed that the price listed online is 5000 IRs higher than the price when you actually visit the store!! I bought one saree at Meena bazaar and headed to our next destination, Karol Bagh. We took a metro from Nirman Vihar station and went to Koral Bagh. As we got down from metro, we took a rickshaw and went towards Ajmal Khan Road, the shopping area. We enjoyed the rickshaw ride very much :). At Karol Bagh, we browsed few shops and went in one of the shops. I was so overwhelmed to see the saree collection there, the price was very reasonable compared to Kathmandu and the sarees were unique as well. At this second shop in Karol Bagh, I bought around 5-6 sarees. After that it was almost evening and it was time for A’s quest. So, we looked for local food stalls around the area. 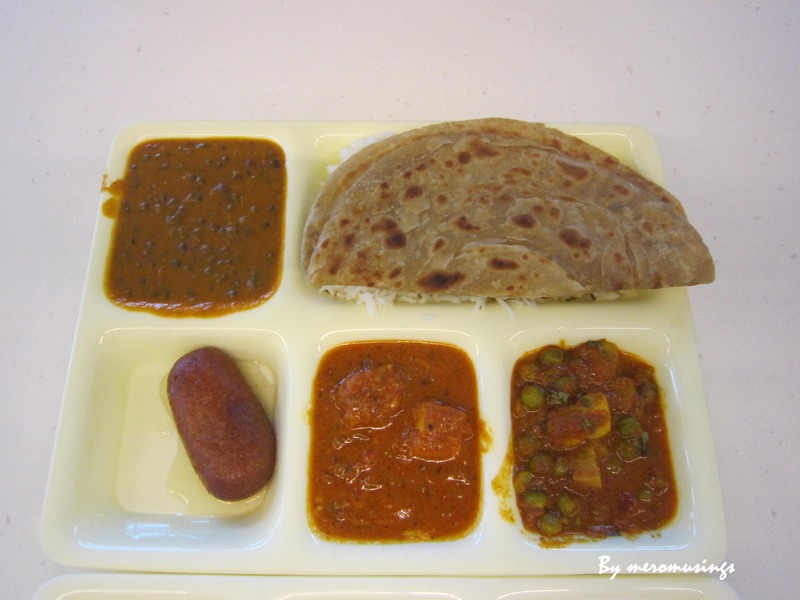 In Delhi, we get a lot of good vegetarian food and there are a lot of options in terms of vegetarian food. We went in a small shop selling local vegetarian snacks. There I ordered veg momo (ordering momo comes naturally to a Nepali regardless of which part of the world you are!! ) and A ordered samosa chat. The veg momo was very spicy and the stuffing was not as good as I expected it to be but the chat was very good. After snacking at Karol Bagh, we took a metro to get back to our guest house. There is a small Tandoori place near Nirman Bihar metro station that sells the most amazing tandoori I’ve ever tasted. Bua used to buy hot yummy tandoori chicken from this place whenever we went to Delhi for Mom’s treatment and we stayed at the same guest house. It opens only in the evening and I was very excited to take A to that tandoori place. We bought the usual half tandoori chicken from there and waited for it to be cooked. The taste of the succulent chicken marinated whole day, slow cooked in the firewood oven, seasoned and spiced with yoghurt, mint, amchur(dried sour mango powder) and local garam masala was simply divine, I can still feel how it melts in your mouth. A was very happy I took him to the tandoori place. And this ended our first day in Delhi, the next post will be about rest of the Delhi trip, hope you will stay tuned :).